The Ocklawaha River winds it way through Marion County from the origination point at Lake Griffin (actually the Green Swamp) to where it leaves the county near the Rodman Dam and the ridiculously stupid Cross Florida Barge Canal. I took this photo at the Sunnyhill Preserve located in the southern edge of the county about a mile from Lake Griffin. I bought an antique Nikon D1h a couple of years ago off of EBay. I got it to use with my old Nikon AI lenses that I've had since the 1980's, in this case I used the 28mm F3.5. The D1h is 2.7 megapixels which will get those in the megapixel races to laughing but I find the shots can be amazingly sharp. This image is actually 6 images (3 high by 2 wide) that I spliced in photoshop and then cropped. I know all about the rule of thirds but I ignored it and put the shoreline right in the middle. I like the image and have a large print of it on the way. 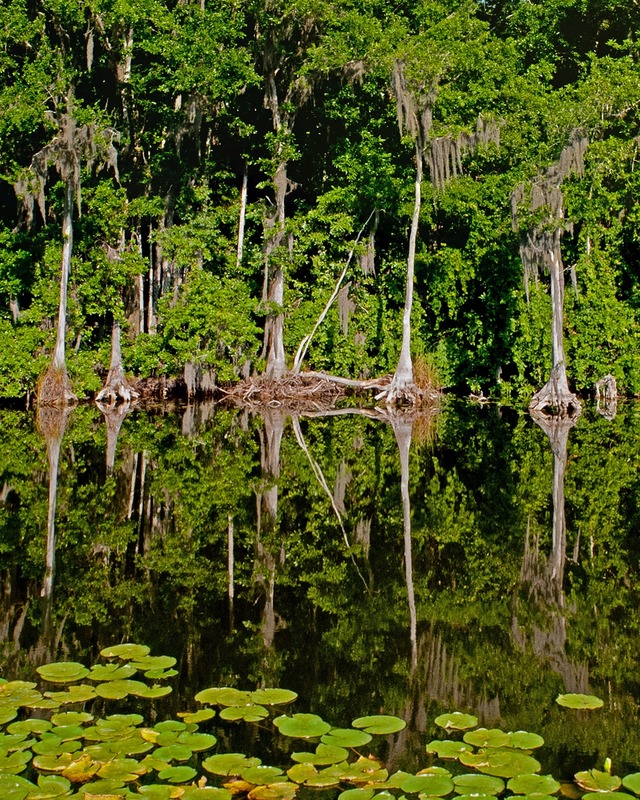 The Ocklawaha River has 2 dams restricting it's flow and animal migrations, the manatee and sturgeon come to mind. Manatees are killed in the Rodman Dam because they are still trying to move through it and into Silver Springs during the winter. 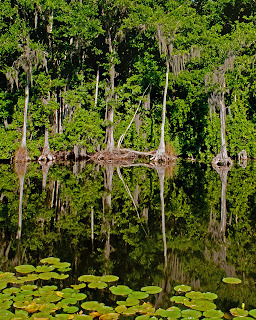 There is a move on to destroy the dams and free the Ocklawaha, on one side are the tree huggers like me and on the other are the fishermen that think there won't be any bass to catch if Lake Rodman suddenly reverts back to a river. I say blow them up and be done with it. The entire 7.5 mile walk from Moss Bluff Dam to the bridge at County Road 42 is atop a large dike that prevents the water from flowing into the Sunnyhill Prairie during times of high water. That's assuming we'll see those times again. If you're interested in this river please take a look at the St John's Water Management District web site and record your opinion.